Helps maintain dermal homeostasis in dogs and cats with oily skin whilst maintaining hydration and minimising unpleasant odour. Leaves the hair soft and shiny. 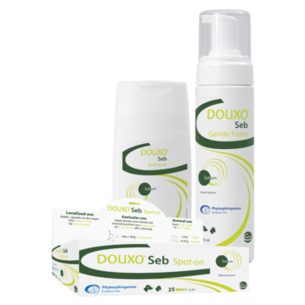 If you have difficulty bathing your pet, DOUXO® Seb Shampoo can be used alongside DOUXO® Seb Mousse. External use only. Wet the coat with warm water. Apply, massage and leave foam for approximately 10 minutes before rinsing. This can be repeated. Use every 3 days. For maintenance, can be used only once a week. Phytosphingosine: universal pro-ceramide, natural constituant of the skin barrier lipids that rebalances the production of oils. Regulating effect on surface microbiota thanks to antibacterial properties. Fomblin, polymer, forms a protective film on the skin surface. Skin hydration and rebalances the production of oils. Green tea fragrance leaves a delicate fragrance on the skin. Concentration under the threshold for declared risk of skin sensitization. All DOUXO® products contain 0% Paraben. Helps maintain dermal homeostasis in dogs and cats with oily skin whilst maintaining hydration and minimising unpleasant odour. Leaves the hair soft and shiny. Can be used on the entire body or for localized application (skin folds, paws,...). 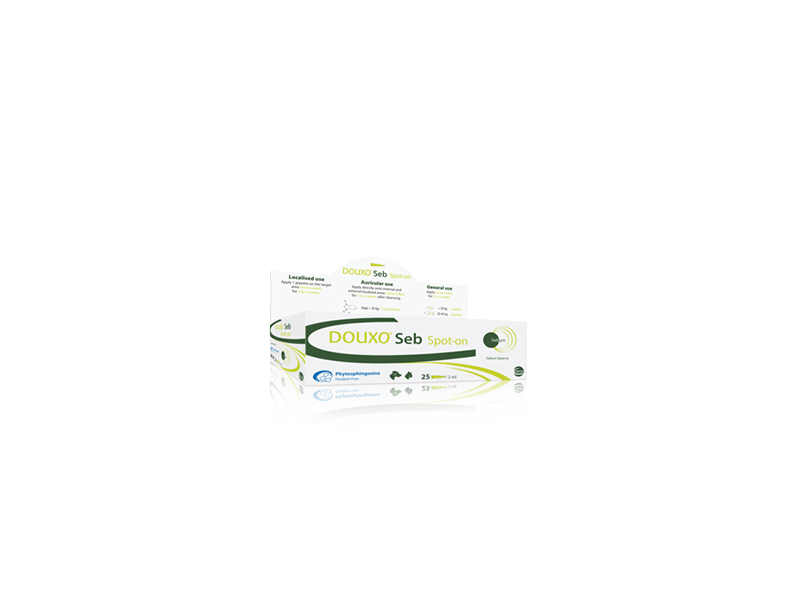 Can be used alone or alternating with DOUXO® Seb Shampoo for optimal results. External use only. Shake well before use. Apply DOUXO® Seb Mousse onto a dry and brushed coat. Dispense 1 or 2 sprays onto the hand and then apply the mousse to the animal, covering the whole body, avoiding areas around the eyes and mouth. Massage into the hair coat in order for the product to reach the skin. Do not rinse. Let air dry. Brush to bring a shine to the coat. Soothex, Boswellia extract. Soothing effect. Its regular use will limit dandruff formation. Can be used on dry elbows, dry nose and waxy ear flaps. External use only. Break the tip of the pipette, apply the contents directly onto the skin, pushing aside the surrounding hair. Use once a week, or twice a week for intensive skin care. High concentration of Phytosphingosine: universal pro-ceramide, natural constituant of the skin barrier lipids. Regulating effect on surface microbiota thanks to antibacterial properties. There are currently no questions for DOUXO Sebum - be the first to ask one!